Disclosure: I was provided with promotional material in exchange for sharing about this upcoming movie release. However, all views shared are mine and mine alone. Parents, educators, animal lovers, military supporters, and history buffs everywhere, Sgt. 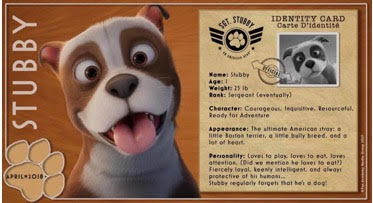 Stubby: An American Hero from Fun Academy Studios is coming to a theater near you on April 13th!!! My girls are counting down the days until Sgt. Stubby: An American Hero arrives in theaters on April 13th. This new animated movie is about an unlikely World World I hero -- a dog. Yes, you read that right. Sgt. 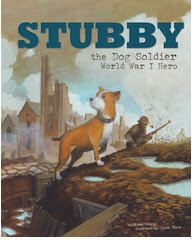 Stubby is a dog, who happened to wander into a training camp in New Haven, Connecticut, and makes an unlikely friend with a soldier named Conroy. When my girls first saw this movie trailer a couple months ago, they instantly fell in love with Stubby. They didn't care about the back story or that this was a story about the war. As soon as they locked eyes with this adorable pup, their hearts melted and they just had to see this movie. 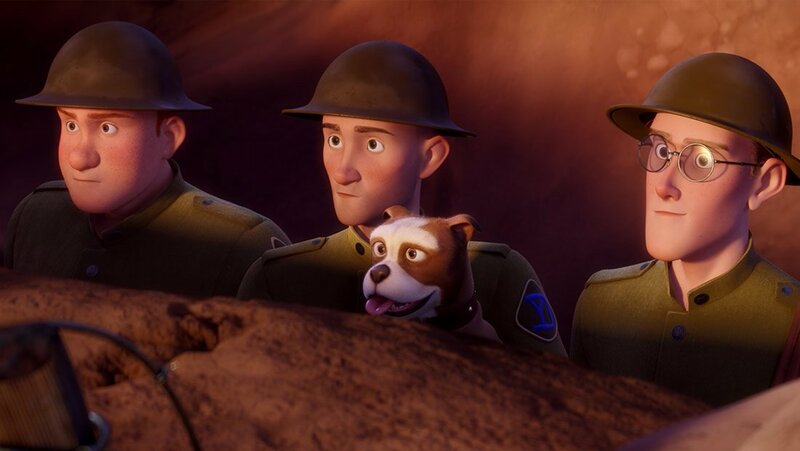 But, after we saw the trailer, I looked online to learn more about the movie, and shared how this movie tells the story of a stray dog who became friends with an Army soldier and together they made history and became WWI heroes. Like so many unsung combat heroes, Sgt. Stubby and Conroy's friendship and bond will warm your heart and make you glad you sat to see their story play out on the big screen. This is definitely one movie you dont' want to miss when it arrives in theaters April 13th. Read on to learn more about this heartwarming movie that will have you looking at stray dogs differently, and be sure to enter my #Stubbymovie giveaway for a chance to win a $50 prize pack featuring a cute and oh so cuddly plush Sgt. Stubby and more. "Did you know that March 13 is National K9 Veterans Day, honoring the day when the U.S. military officially recruited its first Military Working Dog – then called the U.S. Army K9 Corps – in 1942? AND did you also know that, during the previous world war some 25 years earlier, a scrappy stray dog who was rescued off the streets by an American Soldier is widely considered the forerunner to the Military Working Dog program? 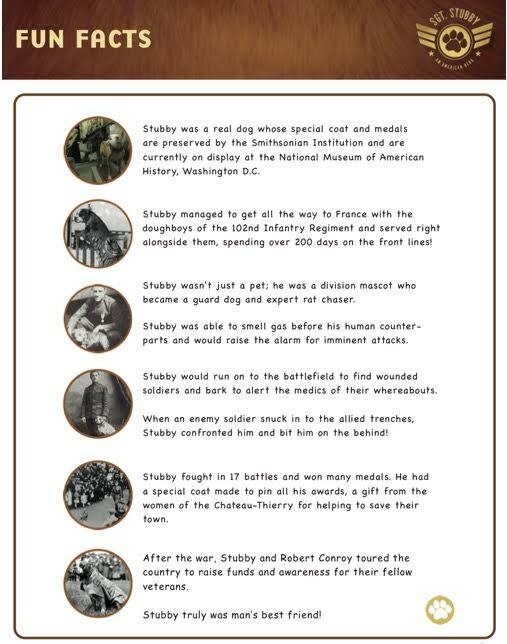 For his valorous feats, Stubby is still recognized today as the first dog promoted to the rank of Sergeant in the U.S. Army, and the most decorated dog in American history! Set against the backdrop of America’s entry into World War I, this CG-animated feature shows the world that the greatest heroes can come from the unlikeliest of places. Opening April 13th on approximately 3,000 screens across the U.S. and Canada and coinciding with the year-long 100th commemoration of the United States’ role in the “War to End All Wars,” Sgt. Stubby: An American Hero tells the story of Army “doughboy” Robert Conroy (Logan Lerman) whose life is forever changed when a little stray dog with a stubby tail wanders into a training camp in New Haven, Conn. Conroy gives his new friend a meal, a name, a family and the chance to embark on an adventure that would define a century. Sgt. Stubby: An American Hero was directed by award-winning documentarian Richard Lanni in his feature film debut and stars Logan Lerman(Fury, The Perks of Being a Wallflower, Percy Jackson & The Olympians), Helena Bonham Carter (the upcoming Ocean’s 8, the Harry Potterfilms, The King’s Speech, Sweeney Todd) and Gérard Depardieu (Life of Pi, Cyrano De Bergerac, The Man in the Iron Mask, Green Card). Featuring an original score by Patrick Doyle (Brave, Thor, Cinderella, Harry Potter and the Goblet of Fire), Sgt. Stubby is produced and distributed by Fun Academy Motion Pictures with animation by Mikros Animation, a Technicolor company. Screenwriters are Richard Lanni and Mike Stokey II (Band of Brothers, The Pacific, Alexander, Born on the Fourth of July), with editing by Mark Solomon (Frankenweenie, Chicken Run, Shark Tale, the upcoming Sherlock Gnomes). Produced by Laurent Rodon and Emily Cantrill; and executive produced by Frank Lumpkin III, Tom Sheehan and Richard Lanni. Genre: Animated, Family, Adventure, History. Running Time: 90 Minutes. Anticipated MPAA Rating: PG." And, now for my fun Sgt. 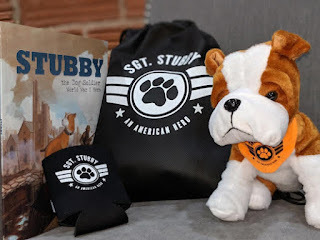 Stubby: An American Hero prize pack giveaway. Prize pack valued at over $50! In addition to the above giveaway, be sure to check out the fun FREE ACTIVITY PACK at www.StubbyMovie.com for more fun facts about Stubby plus some exciting activities, including making your own origami Stubby, a maze, coloring sheets and more! 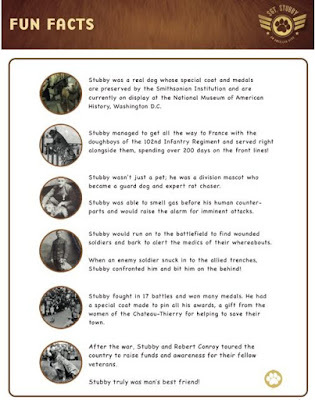 Beyond his military exploits, Stubby’s status as an adopted stray has resulted in nearly a century of recognition by animal rescues and welfare organizations and Fun Academy has partnered with more than 70 regional and national animal organizations across all 50 states to shine a light on the human-animal bond and the amazing things adopted animals can do when given a chance in life. The above FREE downloadable Sgt. Stubby Activity Pack has fun facts, coloring pages, a maze, crossword puzzle and more. This is the perfect activity book to print off and do as you wait for this highly anticipated family-friendly movie arriving in theaters on April 14th. As I write this post, my daughter is Savannah is sitting at the table reading the fun facts to me and coloring the Sgt. Stubby coloring sheets to hang in her room.